That is a fair question, for no one can begin or remain on a path without understanding how it will benefit them. And for many people—judging by the frequent questions received at Krishna.com—the most obvious way to be helped is in their immediate, everyday life. My extolling esoteric wisdom aside, people want a way to increase their earning potential for their family, or even to receive the basic necessities of life. We find that one way Christianity is spread is by offering material resources to impoverished persons and emphasizing the compassion of Christ for the suffering masses. Our Christian brothers and sisters open schools and hospitals where they are needed, and use this as a way to spread the Gospel. I realize this is an oversimplification yet this is a successful strategy. When people are helped on their feet or to survive and thrive they are more receptive to a religious message. If someone is healed, or their life gains material support then their gratitude and experience goes a long way. With all the good they do, the main problem with many religions today is that they think they are the only way to God and thus have campaigns to discount other religions. Promoting intolerance doesn’t improve the world situation. This means that whoever approaches God for any reason and offers him service, is considered a pious man or woman. 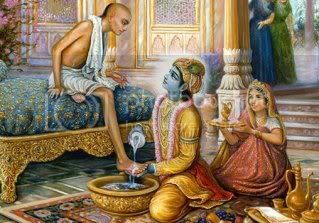 Everyone should be encouraged to understand God or Krishna and pray for one’s necessities, while also understanding that God is not just our order supplier. He is certainly compassionate about our suffering and sends his representatives or sons to teach us the spiritual solution to our problems. What we—the soul—really require for our complete fulfillment is spiritual food for our soul, though it takes an education to understand that our material yearnings are reflections of our deeper spiritual ones. While we should approach God for whatever reason, we also have something more to do than just be religiously pious. It is a good start but not the perfection of life. Although bhakti is based on receiving grace, we also have work or service to do. If we are drowning in the ocean and someone throws us a life preserver, we still have to reach for it and hold on. Certainly Krishna will help us hold on, yet part of his help is for us to become philosophical about life through spiritual knowledge and wisdom. Understanding books like the Bhagavad-gita, Shrimad Bhagavatam and others can open a spiritual light on our life. Such scriptures teach us spiritual, enlightening philosophy about such things as karma and reincarnation as well as the science of God’s avatars. Spiritual knowledge helps us live better in every part of our life. Through taking up additional spiritual practices such as praying, chanting God’s names, and worship we begin to feel His presence in our lives, and see even difficulty in a positive light. 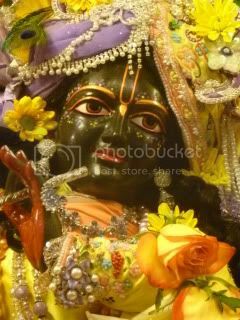 In all circumstances we have to take shelter of Krishna. The downside of only approaching God for our material desires is that if we don't receive them we may give up our belief in God all together. My spiritual teacher Shrila Prabbhupada heard from his Godbrother (another disciple of his guru) who was in Germany before and after WWII that the mothers and wives of the Germany soldiers prayed to God that their sons and husbands would not be killed. When their loved ones were killed they became atheists! 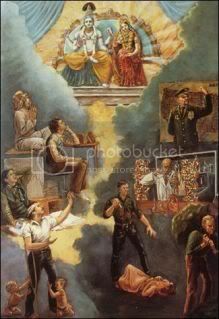 Prabhupada saw this phenomenon of worshiping God for mainly material reasons practically demonstrated in other Western countries by the many vacant churches he observed, reasoning that they were built by people feeling material need and abandoned by those with a high standard of material comfort. I will speak about this more in part 2 of this series.